Have you ever found a product that you thought, "Oh my word! How cool!" That is how I felt when I first found out about Roaring Spring. I am ALWAYS looking for cool, unique paper products. I love sending my kids to school with items that are unique and make them feel special. What is so "neat" about Roaring Spring? It is made from SUGAR CANE!!! If you are like me, you are thinking, they can make PAPER from SUGAR CANE? Yep, they sure can. They make legal pads that are really neat. The above legal pad is actually wider than it is long and it is the EXACT size of my laptop. Think about the last time you tried to write and all you had was a laptop. This makes it MUCH easier. The smaller pad is perfect for placing on the side of your computer to write, or even to place over your screen (not to write but to look at). What I loved most were the notebooks. My daughter lobes them because it says they are made from sugar cane. The paper is excellent quality, and the colored papers are really rich and beautiful (as you can see with the blue above). I love that the paper is more eco-friendly!!! It is made from sustainable, RECOVERED, Sugar Cane fiber! Wow! Cool idea? Stay tuned for a GIVEAWAY!!!!!! MamaBreak received Roaring Spring products to review here on the site. MamaBreak did not receive any other type of compensation. As always our opinions and experiences are our own. That is brilliant. I work in IT and usually carry a laptop everywhere. I do not always have a place to write notes, this would be easy to keep in the bag and easier to take notes. Thanks. Bring on the giveaway!! I love notebooks and paper products. Can't wait for the giveaway!! I love this paper! 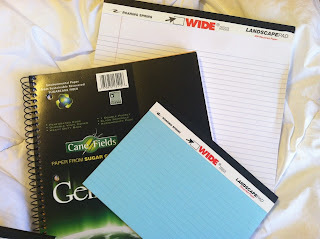 I have some and my favorite thing is the wide tablet it is great for lists and things!